Wow. What a mess. Does anyone know how Takanoiwa plans to make a living from now on? Wouldn’t it be ironic if he wound up teaching at the Yokozuna’s new school in Ulan Bator? He doesn’t have the education to be a real teacher, though he may be a sumo coach, I guess. If he has any sense, then that peace agreement with Harumafuji includes some sort of job prospect, either in Mongolia or in Japan. We’ll just have to wait and see. isn’t it the case that on the days immediately after the original incident, takanoiwa continued to attend jungyo and perform and was to all appearance normal, and no shortage of photos of this? that the doctor visit and injury reports only came up much later and only then was any injury evident? until this issue is sorted, can we really say the affair is put to rest, at least as far as public interest? You know, not being Japanese, I’ve never any opinion one way or the other about Mongolian dominance in sumo, but, by and large, I like most of the Mongolians. Who is more fun to watch than Hakuho? Twice in this tournament he kind of hugged the referee at the end of his bout. Who else would ever do that? I’ve always thought the guy was a great showman and a real hoot. Kakaryu and Tamawashi both have reputations as being nice gentle souls. Hamurafuji, when he wasn’t under the influence, was always a gentleman. The heart-breaking story of Terunofuji, etc. If the Mongolians weren’t a part of grand sumo, I, for one, would miss them terribly. No no no no no. Don’t believe conspiracy theories, at least not to that extent. 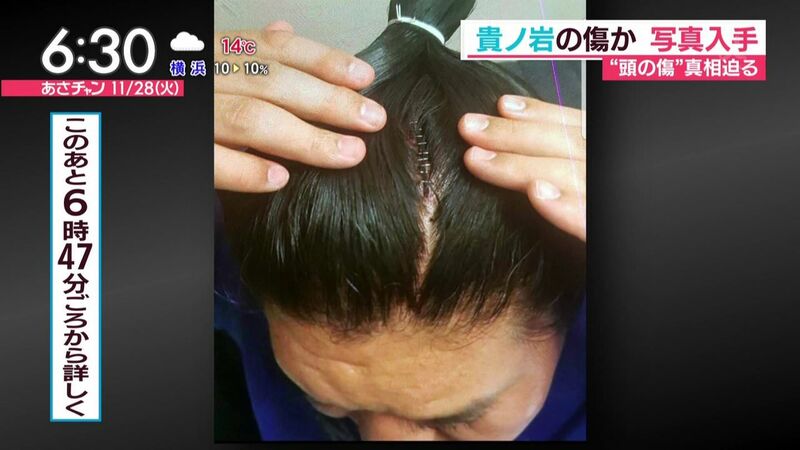 He had a medical certificate from the hospital in Tottori, or maybe the city they visited next, where they stapled up his head laceration. He got a medical certificate for that laceration and a possible concussion, requiring him to rest for something like 12 days. He did participate in the Jungyo but took good care not to use his head for sumo. The head injury was definitely real and happened when it was assumed to happen. There were many suspicious parts to the story afterwards, when the injury was suddenly supposed to include a damage to the skull and leak of cranial fluid. Then there was cellulitis, and that PTSD. And for some of his absences he didn’t even provide a medical certificate. But there is no reason to believe he was “beaten up a second time”, and no evidence whatsoever. So exaggerating his own state to get more money – yes, certainly. Being beaten up a second time? That just smacks of “some other dude shot JFK”. are you saying takanoiwa went straight to hospital from the beating and got stapled, with the medical dated certificates reflecting this, followed by jungyo next and following days? Um, sorry, but I did my homework on that one. There were no visible bruises because the injury was to the scalp, under the chon-mage. The photo with many bruises is actually not from “days later” but an early, unrelated photo (that one confused me as well at the time). It doesn’t walk like a duck, it doesn’t quack like a duck, and sorry, it isn’t a duck. why be sorry if it isn’t a duck? Well, this one, although it served as backdrop to many reports about the Harumafuji incident (including this very screenshot! ), it is actually a photo from 2012, when Takanoiwa advanced to Juryo for the first time. Here is an article from that time with same scene, different angle. do we know that these staples were applied the night of the incident? He got the staples at a Tottori hospital the next day (Oct 26th). Please, let us just put all of this mess in the past. Time to move forward. I honestly hope Takanohana gets himself in order, not for Sumo, but for himself. I think his train is not running on the rails currently. Forgive me for being redundant, but whenever I see sumo wrestlers (past and/or present) acting out and behaving in ways that society frowns upon, the first thing I think of anymore is CTE. After years and years of ferocious headbutts, you simply can’t be surprised if brain damage isn’t a cause of their suspicious behavior. I hope I’m wrong, but it has to be considered. Again, my apologies if I’m being repetitious here. If I had to guess, I would think more like a personality disorder. Brain damage is certainly a consideration but he is not showing the signs that I can see, but he really looks like someone with a personality disorder, most likely Narcissistic. Just a guess. The bb gun reports were about Takanoiwa. (In the past the same was attributed to Chiyonofuji). This branch of the discussion was referring to Takanohana, I believe. Yup, I wonder the same. Good gravy. Thank you for another incredible and thorough write up. About Osunaarashi, yes. He was caught speeding while driving without a license again. And attempting to lie about it again. It may have happened before he started working for RIZIN, but the police caught up with him when he was already under contract. RIZIN dissolved it immediately. And your Osunaarashi reference news story. I admit I’ve always been biased as Harumafuji was my favourite rikishi but he’s being a better person about this than I’d be following the lawsuit, etc. The whole thing has always reeked of a bad incident that was then made way worse by Takanohana manipulating the situation to fit his own agenda regardless of the damage it did to his own rikishi and anyone else. Takanoiws has always seemed like a dumb pawn and that impression was only reinforced after the news came out that he beat his own tsukebito. The whole thing still depresses me and is such a waste of sumo talent. P.S. Did Harumafuji really invest 12m U.S. dollars or was it yen? Dollars. Well, more like 11, as the rate is not exactly 1:100 anymore. But still. The sum in yen was 1,200,000,000. Wow. Never imagined Harumafuji would have made that much money, even as a Yokuzuna. Just did some quick maths on Harumafuji’s salary, at the time of his retirement he was making ~$20k USD per basho. Not including special prizes, kensho, etc. Keep in mind that salary, kensho, mochi-kyukin and special prizes are not the only income source for wrestlers. There are public appearances (every time you see a wrestler in a TV show, a charity event, a shrine dedication and whatnot – he is being compensated for it). Also, one major source of income, especially for Yokozuna and yusho winners, is senshuraku parties. They used to say of Chiyonofuji that he could earn millions (of yen) in just one senshuraku party. Brooks, was thinking the same. He must be an investing genius in his spare time. Forgive my focus on the trivial, but what really struck me about Herouth’s post was the report that, after patching things up, Harumafuji and Takanoiwa went out drinking together! Yikes, that’s what started this whole mess! Ama was my favourite. As a Yokozuna he was second only to Hakuho. His manner and behaviour were exemplary. His loss was tragic at the time and seems an even greater tragedy now. The sumo bosses should have found a way to fix this. I respect the Rikishi but the Japan Sumo Association seems weak and antiquated. It’s a treat to look back at Ama’s fights, especially against Hakuho. 6 Bashos including 3 Zensho. Me too. He was so graceful and so fierce at the same time. He also generally seemed to out of way not to knock fellow rikishi off the dohyo when he could. I also believe that a person’s behavior speaks volumes, and his choice to put his money in a school is admirable. I have heard that he has a drinking problem. I don’t know if that is the case or not, but if so I hope he gets it under control and that he has a happy and successful rest of his life. I also hope that we can get occasional news about how he is. I think that Haramafuji could have won a couple of basho last year. The level at the top was sub par in several of the tournaments. I think it speaks a lot about the character of Haramafuji to make peace with the guy who was basically responsible for the end of his career. I am no fan of Takanoiwa and still hold him responsible for the whole mess. Does he deserve the beating from Haramafuji? Of cos not. But none of us will probably understand the context of what happened that fateful night. By all accounts, Haramafuji has always look after Takanoiwa. And he probably took it upon himself to discipline Takanoiwa when he feels Takannoiwa is out of line, like using the phone when a Yokuzuna is talking to you. The cynic in me think that Takanoiwa is probably desperate for some sort of support (financial, emotional or otherwise) and probably has no choice but to make peace with someone who he has screwed royally over and has always look out for him. Anyway, that is life and we move on. A pity we will never know how many more Yusho Haramafuji could have won. But I am glad he is moving on with his life. About Takanoiwa’s danpatsu-shiki does it take place on a dohyo for a rank and filer and will Haramafuji be allowed to mount it for a symbolic snip? I think Harumafuji understands very well that Takanoiwa was only a pawn in Takanohanas game with little wiggle room for himself. If it’s true that Okami-san is attending the ceremony, but not his former Oyakata, it speaks volumes about Takanohana. On the othe rhand Takanohana might have been invited, but I’m not sure he would really be that welcome. Don’t think any of his rikishi will say anything until far past their retirement, but I’m sure they weren’t all too excited about how they got treated. In the end it may work out for the best thought. they may not have a former Yokozuna as Oyakata anymore, but instead someone who truly cares for his rikishi. Takanohana’s rikishi were very devoted to him, or at least, the twins and Takakeisho were. When the twins still had a Twitter account, they retweeted all kinds of stuff in his defense. They didn’t have to do that. Takakeisho keeps quoting his former stablemaster, and they also stick to his rule of not using wrist and finger taping (though I did spot a tape once in Takagenji’s fingers this basho. Could have been injury rather than apostasy, though). He treated them like family, you see. Problem is, the Hanada family is dysfunctional. He is not speaking to his mother, his brother, and now his son. And don’t forget the marital drama. Do tell, where can I hear more about the marital drama? I somehow had missed the detail about getting divorced. Do you want links to articles in Japanese? Basically, he handed the divorce papers about the same time he resigned from the NSK. There were reports the couple were estranged even before that – already at the time he lost consciousness during a Jungyo event which he attended as shimpan. But you left out that they lied about it for quite awhile, or at least that was the impression I got. I read that he lied, I didn’t hear anything from her side (which is the wise thing to do). There is a pattern … 😉 Takanoiwa isn’t part of the family anymore and the same fate would hit others who rubbed him off the wrong way. It’s hard to believe any of his rikishi have been happy about the way the stable got dissolved. I don’t doubt that they highly respected him before and I think it’s quite natural to want to defend someone’s decision in such a situation. But in the end he dropped them like hot potatoes. About your last question: the danpatsu-shiki will be on the dohyo in the Kokugikan (same dohyo on which the Hatsu basho took place). When they say Harumafuji will attend, it’s pretty much implied that he will be among the symbolic cutters. When you touched on Hanada-san and his unwillingness to meet before Takanoiwa completes 10 years of penance…dude. That was just like…what century is he from? Dentay, I’d love to upvote your comment but the upvote icon hasn’t appeared for me for a couple days. I echo your sentiments. Geeeezzz ! I love this site ! I had just spare infos, but reading this post and the huge number of comments I built the whole image about last year events linked to Ama, Takanoiwa and Takanohana. Thanks guys. But I am truely sad … cause I was catched by sumo seeing Takanohana 20 years ago (what a soap opera close to his personality) , then I loved Asashoryu (forced to retire), then I loved Ama (forced to retire), I loved Tokitenku (he’s dead), I loved Terunofuji (what a sad story) , I had a “taste” for Takanoiwa (forced to retire). 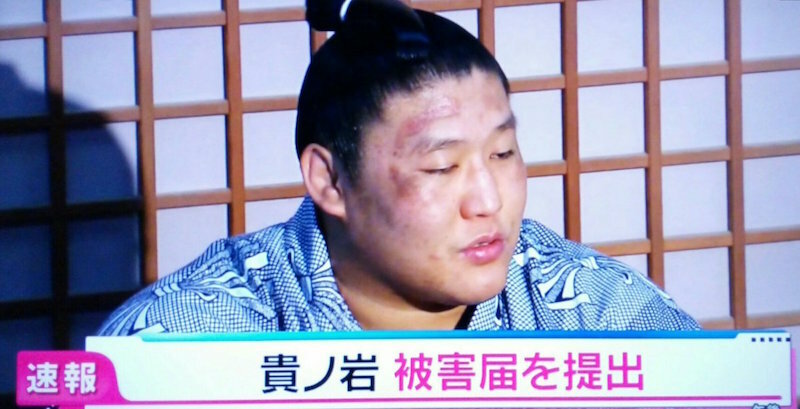 I love Kakuryu ( I hope he’ll be fine and have a natural intai) . I am not from Mongolia , I am from Romania but mongol rikishi are true show-men. They are salt’n pepa of sumo for me … but I never liked Hakuho 🙂 . I have a sense 2/2 will not be the last chapter of this saga. Geeze, Takanohana sounds like someone who let fame get to him and just thought his stuff didn’t stink. As far as some of his former deshi defending him, that’s not uncommon with kids who are in abusive homes, even if the abuse is “just” emotional/verbal/psychological. It may take several years of NOT being in that environment for some of the Taka* deshi to be able to realize, even within themselves, how messed up the heya was in that regard. I do get them still appreciating what Takanohana taught them about sumo–it obviously worked, and if it’s been working, why fix what isn’t broken? As I said on Twitter, THIS was the part of the whole saga that I most wanted to see. The person Harumafuji wronged was Takanoiwa, and only Takanoiwa could “forgive” for that, (though Takanohana seemed to think that right rested in him. A tragic chapter in sumo, but one that could have hit a far darker conclusion than this. I hope all the best for Harumafuji and Takanoiwa going forward. Thanks so much for the write-up. I hope this is (essentially) the end of this awful saga. Solid reporting, Herouth. The above discussions were genuinely good and I’m glad that Harumafuji and Takanoiwa can shake hands, have a good dinner and a few drinks, and let bygones-be-bygones. The whole accumulation of tragic incidents would ultimately end their careers, and also unexpectedly alter their life paths, as well. Both men will never be the same, but perhaps hopefully in time, they will be able to escape the venomous atmosphere that they’re currently in; and to settle into fully enriching positions in their respective communities, and find happiness.